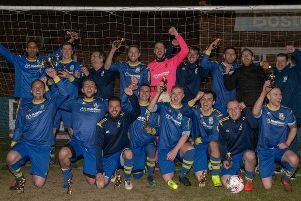 Brigg Town CIC lifted the Mason Bros Lincolnshire Junior Cup following a 3-1 victory over 10-man Horncastle Town tonight. Reece Moody, Jake Reed and Jonny Nicholls were the Zebras’s matchwinners, with Elliot Andrew netting his side’s consolation at Skegness Town’s Vertigo Stadium, where a healthy and vocal crowd watched on. Andrew is mobbed after drawing Horncastle level. Brigg got off to a dream start as Moody gave them the advantage within the opening three minutes, the attacker hooking home after a quick counter attack caught the Wongers napping. But the Zebras couldn’t add to their early goal despite a number of forays forward. While the youthful and speedy Brigg looked at their best on the break, Horncastle created their better chances from set pieces. And their direct approach paid off when Andrew rose highest to meet Andrew Bullivant’s free kick, powering his header into the roof of the net despite the best efforts of keeper Paddy Shaw. Horncastle came close to turning the game on its head but Jasper Caudwell watched his effort bend across the face of goal after good work on the byline from Glyn Powell. The opening five minutes of the second half shifted the advantage firmly in Brigg’s favour. Another lightning start saw Reed get his name on the scoresheet as he reacted first to a low ball into the box. Lewis Burchnall got his frame behind the strike but the power of the effort took it into the net via the post. And seconds later the Wongers were reduced to 10 as Scott Lowman received his marching orders following a robust challenge. The second half didn’t have the urgency of the first. A number of injuries, coupled with Brigg seemingly happy to soak up pressure, added to a stop-start affair. The Zebras still threatened through substitute Nicholls, who tried his best to get in behind the Horncastle back line, while the Wongers thought they had been awarded a lifeline after Jac Wright went down in the box. Referee Michael Redgrift pointed to the spot, only to reverse his decision after a lengthy discussion with his assistant. Horncastle attempted to restore parity, Michael Harness going closest but his audacious 35-yarder landing the wrong side of the crossbar. As men were pushed forward, the gaps opened up at the other end and Nicholls had the final say, breaking free and rounding the onrushing Burchnall to secure victory. There was still time for Shaw to warm his hands as he held onto Caudwell’s drive late on. But by then the match was won.